The flavor ideas all stemmed from the University of Delaware’s Associate in Arts students who work at the UDairy Creamery Market in Wilmington. They came up with the four flavor ideas for the general public to vote on and choose from. To vote, check out the Blue Rocks website. For more information on the partnership between UDairy and the Blue Rocks,check out the recent UDaily article. Janine Sherrier (left), professor of plant and soil sciences, and colleague Harsh Bais, associate professor of plant and soil sciences at UD, were the lead inventors on the patent, which the University has licensed exclusively to BASF. The two professors, along with co-inventor Venkatachalam Lakshmanan, led collaborative research teams studying the microorganism. The Environmental Protection Agency has registered BASF’s new Velondis brand biofungicide seed treatment formulations, which contain a patented University of Delaware beneficial microbe to help plants fight fungal disease. With potential applications in agriculture, horticulture and forestry, the products are designed to boost the protection of seedlings and plants from key soil-borne diseases. The bacteria in Velondis produce a beneficial biofilm and antimicrobial components that promote systemic resistance within the plant, resulting in suppression of disease organisms that attach to root systems. Two of the Velondis biofungicides have additional components that help plants produce a more vigorous root system, resulting in improved plant growth and yield potential. BASF’s Velondis biofungicides contain a strain of the beneficial microbe Bacillus subtilis, which naturally lives in soil and on the surface of plant roots. Scientists at the University of Delaware’s College of Agriculture and Natural Resources conducted research on the microbe with initial support from USDA HATCH funds, and additional funding from the Delaware Biotechnology Institute, the National Science Foundation and BASF. The microbe helps boost the protection of seedlings and plants from soil-borne diseases. “Velondis biofungicides mark a major step for BASF in the use of natural biologicals to help plants fight disease,” said Justin Clark, a technical marketing manager with BASF. 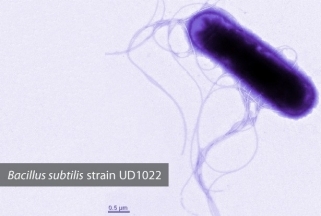 “We plan to use this new active ingredient in a number of different products and applications to help improve disease control and increase crop yield potential.” A key microorganism incorporated in the new Velondis formulations is a unique strain of Bacillus subtilis, a natural, beneficial bacterium that lives on the surface of roots and the surrounding soil, or rhizosphere. Scientists at UD’s College of Agriculture and Natural Resources and the Delaware Biotechnology Institute (DBI) conducted research on the beneficial bacterium with initial support from USDA HATCH funds, and additional funding from DBI, the National Science Foundation and BASF. The University’s Office of Economic Innovation and Partnerships also provided funding and significant intellectual property management. 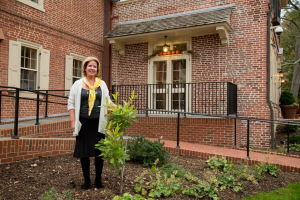 Janine Sherrier, professor of plant and soil sciences, and colleague Harsh Bais, associate professor of plant and soil sciences at UD, were the lead inventors on the patent, which the University has licensed exclusively to BASF. The two professors, along with co-inventor Venkatachalam Lakshmanan, led collaborative research teams studying the microorganism. “At the University of Delaware, we’re able to pursue early discovery work, with the ultimate aim of providing safe and effective tools for growers,” said Sherrier. “The translation of basic research into commercial products is an arduous path, so we are pleased that our work has resulted in the development of new products for agriculture such as Velondis biofungicides.” Velondis biofungicides will be used in different facets of agriculture and will initially be labeled for use with soybeans in spring 2018. Growers can learn more about Velondis biofungicides by visiting BASF Ag Products or by contacting their local BASF representative. With a rapidly growing population, the world is increasingly dependent on our ability to develop and maintain sustainable agriculture and healthy environments. BASF’s Crop Protection division works with farmers, agricultural professionals, pest management experts and others to help make this possible. With their cooperation, BASF is able to sustain an active R&D pipeline, an innovative portfolio of products and services, and teams of experts in the lab and in the field to support customers in making their businesses succeed. In 2016, BASF’s Crop Protection division generated sales of €5.6 billion. For more information, please visit us at www.agriculture.basf.com or on any of our social media channels. BASF Corporation, headquartered in Florham Park, New Jersey, is the North American affiliate of BASF SE, Ludwigshafen, Germany. BASF has more than 17,500 employees in North America, and had sales of $16.2 billion in 2016. For more information about BASF’s North American operations, visit www.basf.us. BASF combines economic success with environmental protection and social responsibility. The approximately 114,000 employees in the BASF Group work on contributing to the success of our customers in nearly all sectors and almost every country in the world. Our portfolio is organized into five segments: Chemicals, Performance Products, Functional Materials & Solutions, Agricultural Solutions and Oil & Gas. BASF generated sales of about €58 billion in 2016. BASF shares are traded on the stock exchanges in Frankfurt (BAS), London (BFA) and Zurich (BAS). Further information at www.basf.com. The University of Delaware’s Kent Messer was looking for something that would allow him and his research team from the Center for Experimental and Applied Economics (CEAE) to stand out in a crowd and drum up participation when they travel to locations for their experiments, while at the same time, being able to serve all of their research needs. Upon returning from a recent trip to Thailand, Messer, the Unidel Howard Cosgrove Chair for the Environment, director of the CEAE and co-director of the Center for Behavioral and Experimental Agri-Environmental Research (CBEAR) in the University’s College of Agriculture and Natural Resources (CANR), found the vehicle that would be truly unique to the state of Delaware: a tuk tuk. “Social scientists always want to recruit a representative sample of participants for their research, but recruiting has become increasingly difficult as people’s lives have become so busy. We needed something that was attractive and instantly welcoming. People smile when they see our tuk tuk and they approach us wanting to learn more,” said Messer. Made in Amsterdam, UD’s tuk tuk is a sort of three-wheeled motorized rickshaw decked out in UD colors and logos that arrived the night before Ag Day and made its debut at the event where it garnered much attention. Maddi Valinski, lab manager for CEAE and program administrator for CBEAR, said that at one point when she was riding in the tuk tuk with Leah Palm-Forster, assistant professor in the Department of Applied Economics and Statistics (APEC), who was driving it at Ag Day, about 50 kids descended on the tuk tuk. “The tuk tuk is very eye catching, and really draws people in. It’s a great way to connect with people and get them interested in our research, more so than just handing out flyers. I think the tuk tuk was part of the reason we were so successful at Ag Day this year. We had over 750 people participate in research compared to 500 last year, which is an incredible increase,” said Valinski. The tuk tuk is a mobile lab that runs off of electricity and can be set up to charge 30 computers inside or house whatever equipment the center needs to run its experiments, such as a fryer or a refrigerator. “Whatever our experiment needs are—for oyster experiments or other consumer experiments—we can customize it similar to the way you would customize a food truck,” Valinski said. It was designed with the help of Keith Heckert, creative and branding director in the UD Communications and Public Affairs office, and has the departmental name and the center’s name, as well as ‘Dare to Experiment,’ emblazoned on the sides. The tuk tuk can only get up to 30 miles per hour so taking it to far away locations requires it to be towed with a trailer, although it is street legal. Funding for the tuk tuk came from APEC, and Valinski said that Tom Ilvento, chair of the department, was great in supporting it and recognizing that it would be a great resource, not just for the center but also for the rest of the department. The tuk tuk will be seen throughout Delaware this summer as it will be used for research on the UD campus, near the UDairy Creamery, and on the Cape May-Lewes Ferry. It has also earned a spot at the United States Department of Agriculture’s farmers market on the National Mall in Washington, D.C. Article by Adam Thomas This article can also be viewed on UDaily. 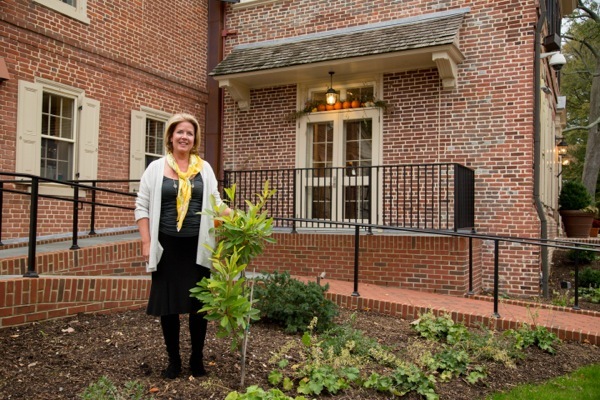 Carla Markell with the gordlinia donated to the governor’s mansion by UD Botanic Gardens. On Friday, May 9, 2014 the Animal and Food Sciences department held their annual end of the semester picnic to celebrate their 2014 graduates. During the picnic students read a poem about their time with the department and at the College of Agriculture and Natural Resources. Here is a link to the poem “Ode From the Class of 2014.” Many thanks to Dr. Limin Kung for sharing the photos he took during the event.